Bob and Tina Hanifin's first-born child arrived on Jan. 25, 1997, but it took Dad and Mom another few days before they decided on a name for their baby boy. "My wife loved it," Bob Hanifin said. "After we named him that, she told me, 'He's going to go on to do great things with this name.'" If you're not familiar with Noah Hanifin, you soon will be. And, yes, it would appear he's on course to do great things, certainly in the hockey arena. This year's NHL draft is billed as the Connor McDavid draft. Or Connor McDavid vs. Jack Eichel. McDavid and Eichel have been labeled generational talents, potential NHL franchise centres, the undisputed top two in the Class of 2015. Hanifin, a defenceman, will be hard pressed to displace either of the star centres, but the Boston College freshman goes into this season as a potential elite offensive blueliner who could yet transform the high end of this draft from a dynamic duo to a tremendous trio. "There's not a huge gap between McDavid or Eichel and Hanifin but there is, to start the season anyway, a gap between those top three and everyone else," said one head scout of an NHL team. "(Hanifin) is at a disadvantage simply because he's a defenceman and the other two guys are centres. But (Hanifin) could be Scott Niedermayer. He skates like him." Hanifin is a shade under 6-foot-3 and weighs 205 pounds. The scouting report says he has world-class wheels, elite offensive skills, can run a power play and use his size effectively to play physically when it's required. He's not quite as big as Nashville Predator Seth Jones, the last prospect, before Hanifin, who went into his NHL draft year billed as the next great American defenceman. Some scouts like Hanifin better than Jones at the same stage of development. Others think the jury is still out on that. Regardless, Hanifin is certainly viewed as being in the same universe as the top defenceman from the 2013 NHL draft, who was ranked No. 1 much of his draft year before going fourth overall to Nashville. TSN's pre-season 2015 NHL draft rankings will be unveiled in a half-hour special (and on www.tsn.ca) Thursday at 7:30pm et/4:30pm pt – at precisely the same time as Hanifin, Eichel and others will be playing in the USA Hockey All-American Prospects Game at Buffalo's First Niagara Center. There is considerable discussion amongst NHL scouts who should start this season as No. 1 – McDavid or Eichel – but (spoiler alert) there's little doubt who's ranked No. 3 – eight of 10 NHL scouts surveyed by TSN have Hanifin right behind the two star centres. Hanifin played last season for USA Hockey's Under-17 program based out of Ann Arbor, Mich., but in late March was added to the Under-18 national team, where he excelled at the Under-18 World Championships last April, helping to lead Team USA to the gold medal. With one goal and five points, Hanifin was highest-scoring American defenceman. "He took over the tournament as an underage defenceman," said another NHL head scout. Hanifin was a teammate of Eichel's at that tournament; Hanifin hasn't played with or against McDavid, though Hanifin did skate this summer with McDavid -- as well as Sam Gagner, John Tavares and other NHLers -- at a skating and skills session in the Toronto area. Hanifin first met McDavid last year at a Boston Bruin game when they were both there as guests of the agent – Bobby Orr – they share. Hanifin is uniquely qualified to size up the Mac (McDavid) or Jack (Eichel) battle, but as one might expect, he's playing it safe, with a fellow American/former teammate who is now a college rival at Boston University and a young Canadian whom he got to know as a friend/training partner this summer. "Well, they're both tremendous players," Hanifin said. "But I just try to focus on my own game and what I can control." "It's always been my goal to play college hockey and I've always wanted to go to Boston College," Hanifin said. "It's a big jump but I'm looking forward to the challenge. I'm feeling confident in practice but I know I'll be playing against guys who are a lot older, a lot more mature. So it's going to be a challenge but I like challenges. I'm looking forward to getting started." Hanifin began his minor hockey career as a forward. But Neil Shea, an NHL scout (now with the Colorado Avalanche) who was Hanifin's coach through much of his minor hockey career in the Boston area with the South Shore Kings, moved him to the blueline, and there's been no looking back. Hanifin also excelled at St. Sebastian's prep school before going to the U.S. program in Ann Arbor. As a 13-year-old eighth grader, Hanifin made the St. Sebastian's varsity high school team, playing against competition as much as five years older. Hanifin grew up in Norwood, Mass., southwest of Boston. He has a younger brother Cole, 12, and younger sister, Lily, 11. His parents – Bob, a Boston court officer, and Tina, who works in human resources with a law firm – both grew up in the city (Boston). Not surprisingly, Noah was raised to be a Bruin fan. "Oh, yeah, my Dad was always a huge Bruin fan," Hanifin said. But the defenceman he most admired growing up was Detroit Red Wing star Nick Lidstrom. Hanifin wore no. 5 in minor hockey and at St. Sebastian's as a tribute to Lidstrom. No. 5 wasn't available with the U-17 team so he wore 55. No. 5 is taken at Boston College, so he'll wear No. 7, which isn't a coincidence. Hanifin is too young to recall Ray Bourque's time with the Bruins but his Dad most certainly imparted some wisdom. "I've watched a lot of Ray Bourque video because my Dad told me all about him," Hanifin said. "Nick Lidstrom and Ray Bourque, those would be the two defencemen I've tried to model my game after." Disappointments have been few and far between in Hanifin's young hockey career, but he was not happy to not be invited to USA Hockey's national junior team summer evaluation camp in Lake Placid, N.Y., though he wasn't alone on that count. 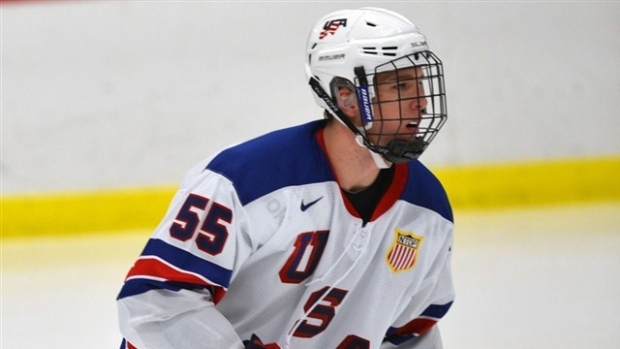 U-17 teammate Zach Werenski, who often was paired on the blueline with Hanifin, was also overlooked. Like Hanifin, Werenski fast-tracked through high school to leave the U.S. program a year early for the University of Michigan. There was speculation the Lake Placid snub was a USA Hockey reaction to the pair bolting early. Players are generally expected to play two seasons - U-17 and U-18 - in the system. Nevertheless, USA Hockey still considers Hanifin, Werenski and, for that matter, Tampa first-rounder draft pick Anthony DeAngelo of the OHL's Sarnia Sting (a third high profile absentee from the Lake Placid camp) as candidates for the U.S. world junior team. "I wasn't that surprised (at not being invited to the summer camp)," Hanifin said. "I'm a young guy but I'm a competitive kid and I feel like I can contribute. (Not getting invited) motivated me even more." In the meantime, he intends to do whatever he can to work on the areas of the game that need improvement. "I'm really focusing on my shot," he said. "I'm working on that a lot. I'm trying to shoot it harder, be better at the one-timers, get more shots through." He's also taking advantage of having Bobby Orr as a sounding board and confidante. "The biggest thing Bobby tells me is to not get caught up in everything -- the draft, the attention, the pressure, all that stuff," Hanifin said. "He tells me to embrace it, just enjoy playing, just try to have fun playing the game and focusing on that." So that is what he will do, and it all starts in earnest this week: McDavid's third OHL season with the Erie Otters begins on Wednesday; Eichel, Hanifin and the best young American talent playing in the U.S. prospects game in Buffalo on Thursday.